Pandanus utilis growing tree of the genus Pandanus also known as Common screwpine, Pandanus utilis perennial evergreen plant, used as ornamental for the fruit and the plant and fruits edible, can grow in mediterranean, desert, subtropical, temperate, tropic climate and growing in hardiness zone 10b+. Flower color yellow and dioecious male and female flowers on different plants, male flowers are like feather and female grow like ball. 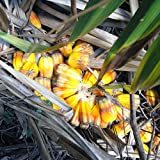 Pandanus Palm Seeds (Pandanus utilis) 5+ Rare Tropical Palm Tree Seeds + FREE Bonus 6 Variety Seed Pack - a .95 Value!! Pandanus Palm Seeds (Pandanus utilis) 5+ Rare Tropical Palm Tree Seeds + FREE Bonus 6 Variety Seed Pack - a $29.95 Value! !